Protect it, or forget it. Design, that is! Why? Only good design gets copied so many designers may run the risk of their IP being infringed. Now, when the IP Act becomes law on 1 October 2014, if you have registered your designs there are tougher penalties if they are intentionally copied. The idea behind the IP Act is to simplify and strengthen design protection for the UK's hugely important design sector. It will also send a clear deterrent message to copyists. Design theft happened to me. Badly. In the mid 1980s, a colleague and I created Holbein, a company producing hand painted decorative accessories for top interior designers. The business was a great success. But it came with a huge problem: theft. Every time we launched a new design, it was knocked off by larger companies without any hope of redress. Like the vast majority of Britain's 350,000 design companies, we were a tiny outfit. We weren't in a position to take on the unscrupulous thieves and copycats. We had no idea where to start. In May, our 15-year long case study campaign helped to influence government in a landmark Act of Parliament. It makes intentional copying a registered design a criminal offence punishable by prison. But there's still a lot more to do to keep our army of 350,000 designers fully protected. The majority of designers rely on unregistered rights and design law is still complex. So what can you do to prevent someone ripping off your design - and what action can you take if you find out it's already happened? If costs permit, make sure you register your designs as comprehensively as possible. UK and EU registration authorities do not examine your registrations so what you submit is what you have to rely on. So, the more detail you include, the better! Alternatively, if you can’t afford registration ACID membership will give you access to a Design Databank through ACID marketplace which holds over 300,000 designs. This doesn’t add to your design rights but gives independent evidence of the date they are received by us. Sounds simple. But when it comes to proving your design ownership, an audit trail of the detailed journey from idea to marketplace is compelling. The majority of cases ACID members have settled are based on strong evidence to support designs. This is whether they are registered or unregistered. Know the IP laws that protect you, watch the competition. What’s in a name? Trade mark your brand name if you can. The more you build up your reputation either under your own name or one you trade under, the stronger protection you have. Take a look at the IPO website. ACID started the UK’s first Designs Exchange, which the government warmly welcomed. It is a safer trading platform where designers can lodge their work and create positive relationships with design buyers. They can view your latest designs by registering and agreeing to the ACID Design Buyers’ Charter. The good news is that you can track who has viewed them. Think about IP Insurance. You insure you car and your home, why not your designs and future? 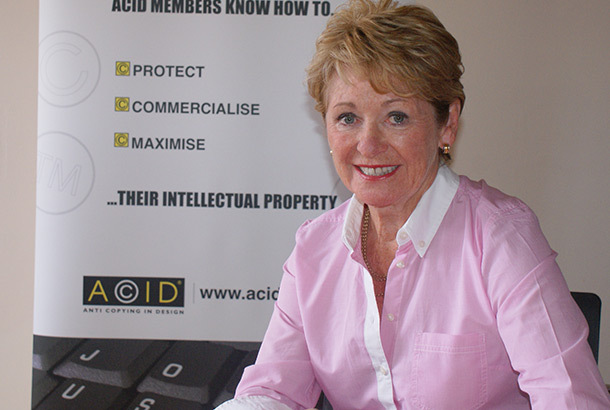 ACID will launch its own IP insurance product for registered and unregistered designs in the autumn. 5. Do you need an expert opinion? Often, it is difficult to decide whether your case is strong enough to take legal action? Looking to the future, part of the IP Act will be to introduce a new IPO Designs Opinions Service. Also, if you don’t know what is and isn’t protected under unregistered rights, this has now been clarified. Imitation isn't flattery if it costs you your business. It nearly cost me mine!